Fiumicino passenger and car ferry ticket prices, timetables, ticket reservations and information for ferries sailing from Fiumicino to Civitavecchia and Arbatax. Compare all available Fiumicino ferry ticket prices in real time and book the cheapest available Fiumicino car and passenger ferry tickets sailing to and from Fiumicino, Civitavecchia and Arbatax with Tirrenia di Navigazione ferries online with instant confirmation. Book Fiumicino Ferry Tickets with Tirrenia di Navigazione for ferries sailing from Fiumicino to Civitavecchia and Arbatax online in advance to enjoy the cheapest available ferry ticket price. The price you see is the price you pay. There are no hidden extras or surprises such as added fuel surcharges or booking fees and we do not charge you anything extra for paying with a Visa Electron card. The price we quote you for your selected Fiumicino passenger or car ferry ticket, onboard accommodation and vehicle type is all you will pay, and that's a promise. To obtain a Fiumicino ferry ticket price and book your ferry ticket securely online please use the real time ferry booking form on the left. You are also able to add a hotel at your destination, or anywhere else, to your ferry ticket when completing your ferry ticket reservation. Fiumicino is a large fishing town on the Tyrrhenian Sea coast that has grown in recent years with the building of the Leonardo da Vinci international airport. Fiumicino is famous for its seafood restaurants and wonderful black sand beach. Fiumicino is 34 kilometres from Rome and is home to over 50,000 inhabitants. The whole region of Fiumicino is a great archaeological treasure which is reflected in the various museums nearby. The new Port of Concordia of Fiumicino is one of the best projects in terms of quality and facilities among the Italian and non-Italian tourist ports. It will be the largest tourist ports in Europe an eco-friendly port. The dock will be integrated with the city of Fiumicino, in a strategic position for logistics and connections, in an area that certainly is interesting for tourists, thanks to its landscape and history. The new tourist Port of Fiumicino will be built in the Isola Sacra area, , which is located to the north of the Tiber river mouth, and it will be well connected to the main road network and in the immediate vicinity of Fiumicino airport. Fiumicino is a central-Italian town and comune in the province of Rome, in which the busy Leonardo Da Vinci International Airport is located which serves the national capital Rome. Fiumicino is a large fishing town on the Tyrrhenian Sea coast and has long been known for its great seafood restaurants. It also is a weekend getaway for the people of Rome, especially in the summer. There is a good beach but the sand is black due to the high iron content in it. The name means little river. The town of "Fiumicino" should not be confused with its namesake, Fiumicino, a small river near Rimini. Fiumicino was originally a fishing village and is till an important fishing center. It is situated on the west coast of Italy, in the province of Rome. Rome’s Leonardo da Vinci International Airport is close by and is more normally referred to as Fiumicino Airport these days, with the international code FCO. The town is home to approximately 60,000 inhabitants. This region enjoys a Mediterranean climate similar to that of Rome, with occasional sea breezes to keep it cooler in summer. Spring and autumn are the best time to visit as the weather is most pleasant at this time. In the peak of summers, the temperature tends to regularly go over 35°C. Winters are mild. The town of Fiumicino, which includes the beautiful "Isola Sacra", or "Sacred Island", has ancient origins and, indeed, dates to Roman times. It was a favorite summer vacation spot for many of the upper class Roman elite. The town subsequently went into slow decline, but started picking up again in the beginning of the 19th century. A real boom in the town's activity began in the 1950s and 1960s, when Rome's Intercontinental Airport, Leonardo Da Vinci, was constructed here. Fiumicino is famous for its beautiful pier, a favorite spot for long walks. Tourists also immensely enjoy the exquisite cuisine, mainly based on seafood. The numerous restaurants along the pier are always packed with people anxious to try the daily special. Tourists who enjoy immersing themselves in the local culture of a place should make sure to hang around the pier in the afternoons. It's at this time that fishermen return to shore with their catch and it's at this time that the impromptu fish market springs to life. Lately, it has also become a popular retreat for people from Rome. It is also a popular place for visitors to stay while visiting Rome. If you are flying out from Fiumicino airport it could be a pleasant place to stay your last night, avoiding the hassle of Rome's traffic on the way to catch your flight. Best Price Guarantee - We always offer you our lowest available Tirrenia di Navigazione passenger and car ferries ticket price to and from Fiumicino. There are no hidden extras or surprises such as added fuel surcharges or booking fees and we also we do not charge you anything extra for paying with a Visa Electron card. The price we quote for your selected Fiumicino ferry ticket, onboard accommodation and vehicle type is all you will pay, and that's a promise! 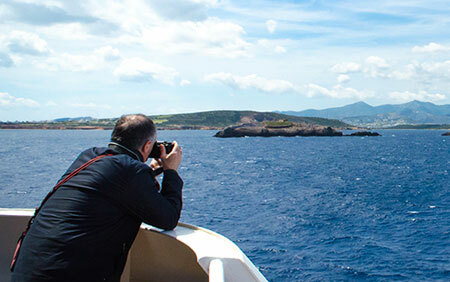 In the unlikely event you find the same all inclusive Fiumicino ferry ticket cheaper in the brochure of any other tour operator we promise that we will do our best to beat that price or offer you the choice of requesting a refund. To book Fiumicino car and passenger ferry tickets please click here. At ferryto.co.uk you are able to obtain live Fiumicino ferry ticket prices, check availability and book car and passenger ferry tickets to and from Fiumicino at our lowest available ticket price. Ferryto.co.uk is part of the world's largest online ferry ticket distribution network providing the ability to book over 80 major European ferry operators including to Fiumicino and to over 1,200 other ferry routes throughout the UK, France, Spain, Ireland, Holland, Eastern Europe, the Mediterranean, the Baltic and North Africa.